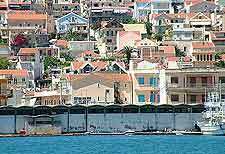 Transport options from Kefalonia Island International Airport to Argostoli and other nearby cities include taxis and private mini-vans. Taxi ranks are on offer just outside the terminal. Some hotels and resorts provide private mini-vans to pick guests up from the airport. It is best to check with your accommodation provider about these services in advance. There is also the option of hiring a car, which is the most convenient way to get around the island. Kefalonia Island International Airport has 80 short-term parking spaces situated near the terminal and 30 long-term spaces. Disabled parking is provided in the short-term car park.